Parent and child holding hands statue is a really fascinating way of capturing you and your child holding hands forever, this kit creates a beautiful and really detailed statue which looks amazing and will make a great talking point for anyone who sees it! The difference between the sizes of your hands is highlighted as every line, wrinkle and nail is captured with the simple to use kit. As the material sets quite quickly we give you enough materials to create up to 2 statues and a solid oak display plinth to display your best one on. Our kit even includes the container to take the mould in, making it really straightforward to do and create a really beautiful cast of either an adult holding a child's hand or of siblings holding each others hands (please note that in order for them to do this, they will need to be able to hold hands for approx. 2 mins; or if they are tiny, for you to be able to hold their hand for this amount of time), simply choose what colour you would like to paint your finished statue and the kit will be sent with everything you need and easy to follow instructions too. 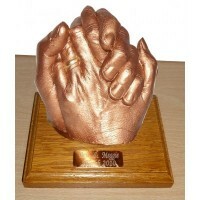 This holding hands statue captures a memory forever and is sure to make you smile, this hand casting kit includes everything you need to capture the statue twice, so you have a good chance of creating a good completed cast even if you manage to get one wrong. An original wedding gift or a unique way to mark a special anniversary, or just a lovely way to be a..